Learn how to use sub-domain to create beautiful unique plus sites in Showit. A +Site is a subdomain of your main site. +Sites can be used for a variety of purposes including custom websites for your clients, custom sites for your workshops, or maybe a special package and pricing site. With your Showit subscription you are able to create and publish an unlimited number of +Sites. Start by first creating a new site in Showit. Click on your name in the lower left corner of Showit. Choose “Create a New Site” and select a design. Complete your site design and then follow the next steps to setup the custom +Site URL. Follow these steps when you’re ready to publish a +Site and assign a +Site Domain. Be careful not to select your MAIN DOMAIN in the Domain Settings drop down menu. If you do select your main domain and hit publish it will publish over your existing main design. Trouble with a +Site Not Publishing? 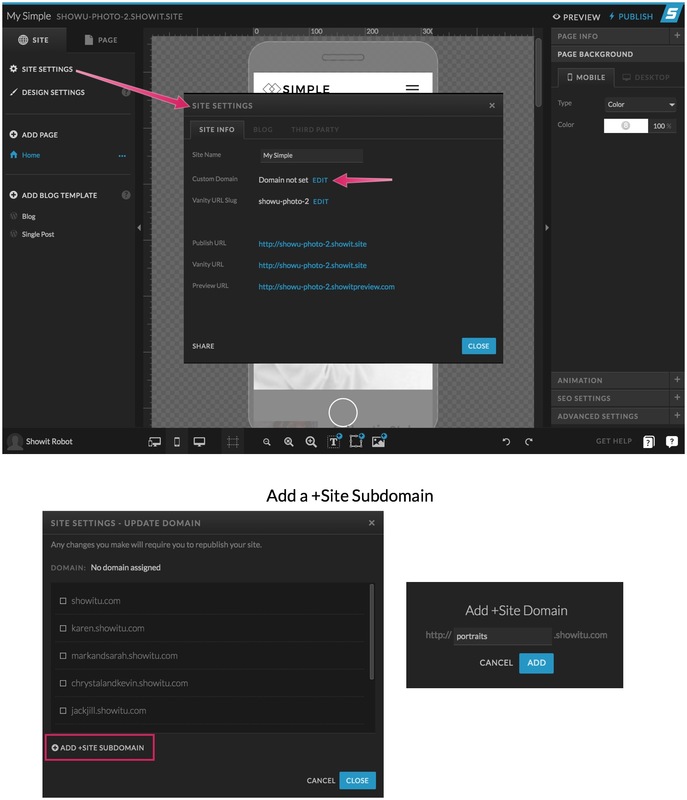 If you’re experiencing trouble getting your custom +Site subdomain to load for you it’s possible your domain needs to be configured for +Sites to properly work. Click the ? chat icon on the bottom right of Showit to contact our support team to help get it configured for you. More resources from our incredible community of designers and Showit users.